One of the best things about manga is the community it creates: how it brings people together and allows you to bond with and make new friendships that last a lifetime, all the while giving you something to talk about that you’re incredible passionate about. 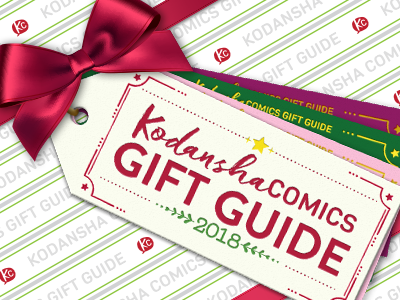 When working in manga, however, it’s not often that we get to speak face-to-face with our readers about our favorite series, so our third, and final, part of our Gift Guide is dedicated to all the amazing Kodansha Comics fans, and is a gift from us to you—our personal favorite staff picks! If you haven’t checked these series out already, we hope we can help you discover a new favorite series—and that you come to love them as much as we do! It’s no secret in the Kodansha office (or to anyone I meet, really) that my favorite manga series of all time is Attack on Titan—so two of the things I was looking forward to the most this year was the premiere of Attack on Titan Season 3 and to the release of our Attack on Titan Season Manga Box Sets (and to rereading the manga before the new season premiere!). One of the aspects that I love the most about Attack on Titan is that it never fails to surprise me, and that just when I think I have of an idea of what Isayama is planning, he throws another curve ball—to both his characters and his readers. Eren, especially, has faced some of the most difficult and interesting challenges and character developments as the story has progressed, and the arc covered in the Season 3 Manga Box Sets is one of my favorites of the series thus far. We not only get to see Eren get the same spark he had at the beginning of the series back, but we also get even more depth and development of Levi, Armin, Erwin, their relationships and interactions with one another, and more. This is also when we finally get a little closer to the truth about the Titans—and of the world Eren and his comrades live in—and were the chapters that had me most on the edge of my seat. Couple that with the Season 3 anime premiere this summer, and I couldn’t have been any more proud to be an Attack on Titan fan—it was not only great seeing the start of my favorite arc animated, but while the new season aired I couldn’t resist rereading the manga, which made me fall in love with the series all over again. Not only did I think the timing couldn’t be any better for Titan fans, but the Attack on Titan Season Manga Box Sets were something I hoped both older and newer fans of Attack on Titan would come to enjoy. The design of the box sets themselves are not only super cool (and feature the Titan trio staring you down when you turn them on the side), making them great collector’s gifts for old and new fans alike, but they also feature exclusive bonus items—such as a wicked double-sided poster of Eren (in the Season 2 box set), and a bonus booklet of never-before-seen short stories (in the Season 3 Part 1 box set). If it’s one thing any Attack on Titan fan knows it’s that the Titans show no mercy when it comes to taking the lives of our favorite characters, so the short story collection is especially great because it allows us to see our favorite characters interacting in ways in which we haven’t had a chance to see in the manga—and gives even more depth to characters such as Eren, Levi, Armin, Jean, and more. The Attack on Titan Season Manga Box Sets are something I loved both working on and enjoying as a fan, and are definitely sets I’ll keep coming back to as I wait for the return of Attack on Titan Season 3 Part 2. 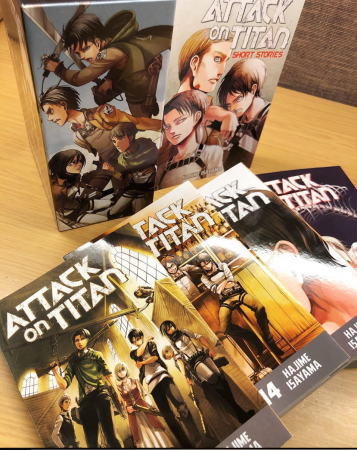 Attack on Titan Season Manga Box Sets Season 1 Part 1 through Season 3 Part 1 are available now. Season 3 Part 2 box set coming Summer 2019! Need more Titan? The latest volume, Attack on Titan 26, is out now! Want more recommendations? Tiff’s previous Attack on Titan-themed staff recommendations include Spoof on Titan—check out their review here! 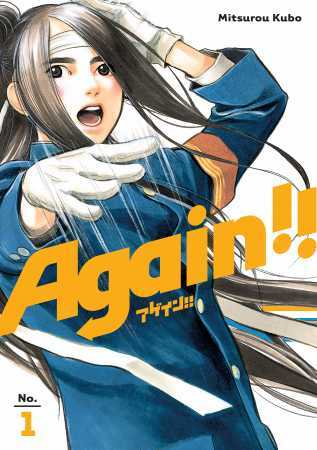 … ok, so it’s also no secret that another favorite Kodansha series of mine is Again! !, and between that and Attack on Titan, I couldn’t possibly choose between the two, and had to write about both of them. While Again! !’s story couldn’t be any more different from Attack on Titan or Descending Stories: Showa Genroku Rakugo Shinju (one of my previous staff picks), one of the main reasons why I love Again! !is for the same reasons that draw me to Attack on Titan and Descending Stories—it has a compelling story that leaves me wanting to read more and not sure what to expect next, starring characters whose genuine experiences and emotions hit me at my core, and whom I can’t help but relate to. Again! !is the story about Kinichiro Imamura, who, on the last day of high school, realizes he had gone three years without joining any clubs or making any friends. He’s not exactly bittersweet about graduation, and would now much rather leave it all behind him, But a tumble down a flight of stairs soon sends him three years in the past—back to the first day of high school. Now, Kinichiro not only has the chance to do high school all over again, but he also gets wrapped up in saving his school’s ouendan cheering club from the brink of disbandment. Right off the bat, there were so many things about this series that captivated me—the mystery regarding Kinichiro’s time travel (is this all a bad dream, or did he really go three years into the past? ), his mixed feelings of preferring solitude but also feeling isolated and disregarding by his classmates, and the overarching thought—what would it be like to do things all over again? Again!! creator Mitsurou Kubo is nothing short of a storytelling genius, and crafts not only a gripping story, but also has a way of making Kinichiro’s experiences and feelings so incredibly sincere and candid. From his musings about what if he had done high school differently, regretting choices he did or did not make, or wondering if it even mattered if he was around or not, Kubo centers Kinichiro as not only an interesting, relatable protagonist, but also couples incredibly real, sometimes dark moments with natural humor, and an all-star cast of characters that are just as enjoyable to cheer on. If you’re looking for a step up from your ordinary high school manga, or for a new series that blends excellent characters with both reality and humor, you’ll definitely want to give Again!! a read. Again!! Volumes 1 through 5 are available now. Volume 6 coming December 13, 2018! Want to give it a read now? Read the first chapter here! Want more recommendations? Tiff’s previous staff recommendations include Descending Stories: Showa Genroku Rakugo Shinju—check out their review here, and read a first chapter preview here! This sci-fi/fantasy series features two kids taking on the vast, mysterious cosmos: Rebecca, a social media girl (think avid Youtuber) piloting her spaceship to shoot her next viral video, along with Shiki, a clueless boy with ancient and rare robotic powers. And of course, there’s Happy, their cute cat companion … weapon? Yes, that’s right—our beloved Happy starts whirring and spinning and transforms mid-battle! This is what’s so exciting about EDENS ZERO. Mashima leans in to all the grand, science-y, mechanical ideas that couldn’t fit in to the lore and tone of his earlier series, Fairy Tail and Rave Master. Back when Fairy Tail was wrapping up its final story arc (and even during its origin story in Fairy Tail ZERO), it seemed as if Mashima wanted to go bigger and badder with each reveal. EDENS ZERO does just that, right from Chapter One. He’s clearly built up EDENS ZERO as a masterful shonen adventure. I love to imagine new readers and younger readers experiencing Mashima’s world for the first time through EDENS ZERO. It showcases all the polished skills (both art and story-wise) that the author has gained over his two decades of making hit manga. How lucky you get to experience that from the beginning, at the height of his craft! Rave Master was the first series I ever bought with my own allowance, and I’ve worked on so many of Mashima’s English releases, so when I read EDENS ZERO, I read it from my heart, and in awe of how he just keeps improving. And for fellow returning Mashima readers, let yourself be swept off your feet too! From a holographic space goddess, to space pirates, to mechanic space dragons, EDENS ZERO hints at both fun and tragic back stories to come. But while we await Volume 2, you can catch me flipping through EDENS ZERO just to count every Plue and every Fairy Tail member sketched in the crowd scenes. EDENS ZERO is a fresh new start for a creator who clearly has so many ideas churning in his mind at all times. If you’re feeling nostalgic, or want a good laugh, or are curious to look inside Mashima’s brain a bit more, you can also check out his short story compilation, Hiro Mashima’s Playground. 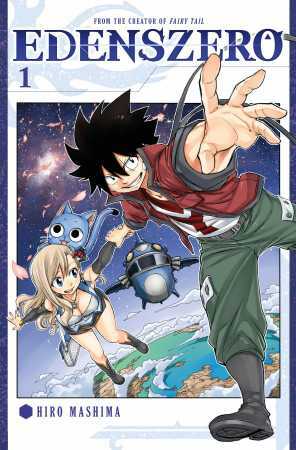 EDENS ZERO Volume 1 is available now. Volume 2 coming February 2019! Want to give it a read now? Read the first chapter here! Want more recommendations? Haruko’s previous staff recommendations include Animal Land and Wake Up, Sleeping Beauty – check out her reviews for those series here and here! You might know Kosuke Fujishima as the creator of the long-running magical romantic comedy Ah My Goddess. What you might not know is that all of his manga—even Ah My Goddess!—tend to feature cars, motorcycles, and other motorized vehicles with a remarkable frequency. 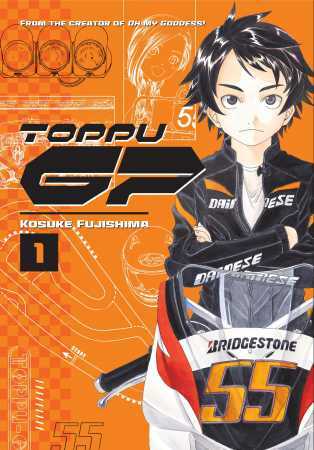 Fujishima-sensei is a major gear-head, and with his latest title, Toppu GP, he goes full-throttle on his love of motorcycles. Toppu GP follows the career of Toppu Uno. We learn in the first volume’s opening pages that he’s destined to make it to MotoGP, the highest level of motorcycle road racing—but then we’re immediately taken to his days as a tween racer in Japan, just starting out on his journey to the top. In typical Fujishima style, the motorcycles and racing action are depicted with meticulous precision, and the comedic interludes between races are a delight. The young Toppu has a crush on Myne, an older girl who also races, and getting to watch her outrace the boys in her class is just as thrilling as Toppu’s races. This is this a great gift for any Ah My Goddess fan, but thanks to its mechanical accuracy and dynamic racing art, it’s perfect for the motorsports maniac in your life. If they’re not a manga fan, they will be once they finish Toppu GP! Want more recommendations? Paul’s previous staff recommendation was Welcome to the Ballroom —check out his review here, and read a first chapter preview here! 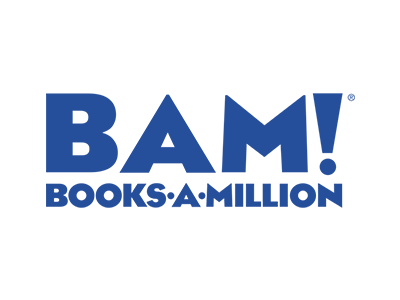 Head on over to Books a Million for their Graphic Novels and Manga: Buy 2, Get 3rd Free Sale! This wraps it up for our Gift Guide series this year! We hope we’ve given you plenty of ideas for what to wrap up for your loved ones—and put on your own wish list! Did you check out the KC Gift Guide Part 1 & 2? Click here! All of us at Kodansha Comics wish you a safe and happy holiday. Thank you for helping us make 2018 a great year to read manga—we can’t wait to give you more in the New Year!